Lumo jewelry $100 gift card giveaway! If you have not yet heard of Lumo, and you are as in love with delicate, elegant jewelry pieces as I am, then you should be prepared to get excited. If you have heard of Lumo, then you are probably already really excited, and can feel free to skip right to the end and enter the giveaway. Handcrafted and designed in California, Lumo's offerings include page after page of gorgeous stacking rings with semi-precious stones, just look at the splash on their homepage and be careful not to drool on your keyboard. If rings aren't your thing, not to worry, dozens of necklaces, earrings and bracelets are available. If I hadn't been so smitten with the gold rings I chose, I might have gone for this quartz necklace and one of their initial bracelets, but you should really browse around for yourself and decide, since Lumo is offering one lucky reader $100 to spend at their site! As for today's outfit, I really love the simplicity of it, and it shows off my handy-work - both the trench and the jeans were altered by me. The hem of the jeans was deliberately left unfinished. I feel like there is a lot of uncertainty with denim lengths these days; if I change my mind and want them shorter, I just have to cut. Thank you to Lumo for sponsoring this post and giveaway. That ring is beautiful (and sort of goes with this whole outfit perfectly). That trench is perfect! Love this classic chic look lady! I would have to get one of the initial bracelets. It's the perfect shade to go with my brass bracelets that I almost always wear. This is so chic. 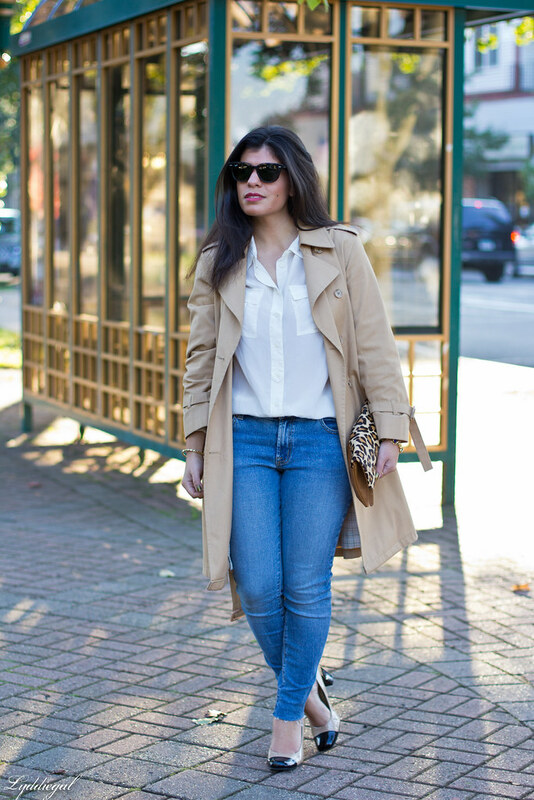 I don't know if there's anything more classic than a trench, jeans, and a white button up. It' always looks so put together and it's one of the simplest combinations out there. Chic look, indeed! I'm guessing this is the London Fog trench you told me about. I love it. GREAT thrift find! i would have to get the three triangles necklace from LUMO- so cute for fall! 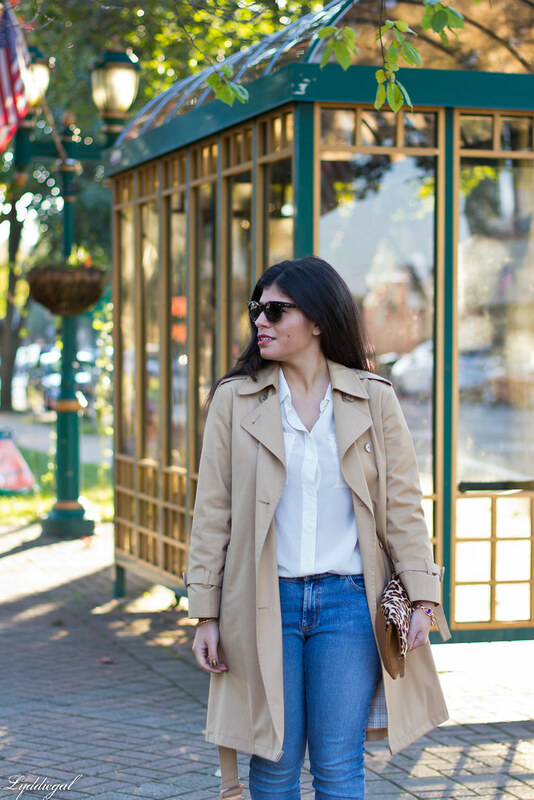 In love with your trench coat!!!! 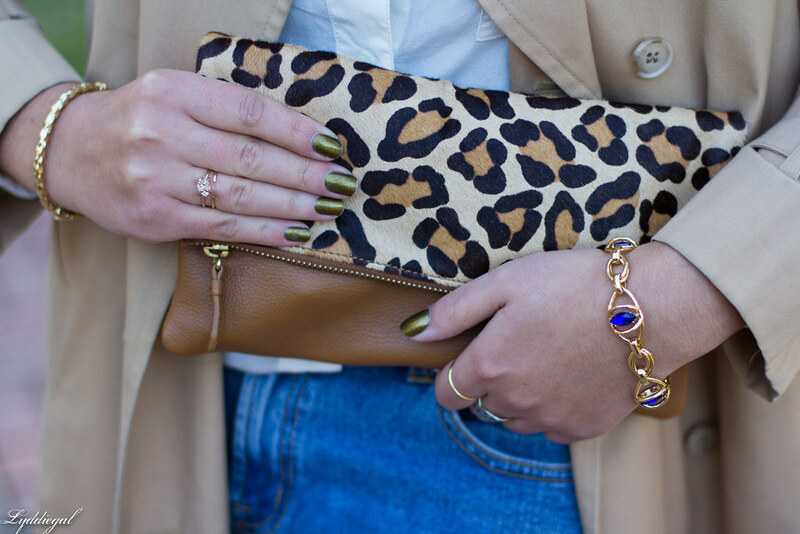 I love the leopard clutch - so cute! Gorgeous girl!! In love with that tench! And the leopard clutch is amazing! I like the simple gold ring or the brass necklace! Amazing giveaway, such a pity i'm from spain!!! And you have a great blog. Let me know if you want we follow each other by GFC, bloglovin', google+, etc. I hope so: I'll be waiting for you!!! Love this great classic look! I really enjoyed looking at your jewelry and definitely feel like I need to check out Lumo now. Thanks for sharing! I love the 14K CROSSROAD ring. 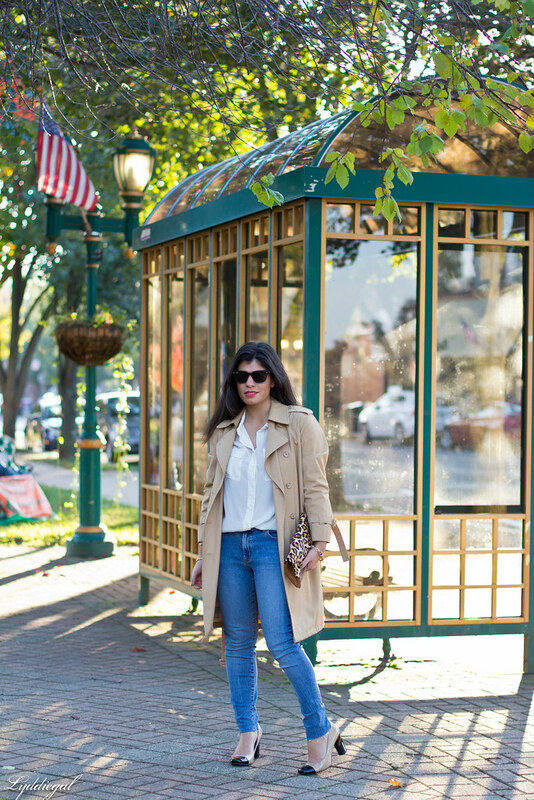 A trench coat and jeans makes the perfect outfit! It goes great with your leopard clutch! I love the fact that you did your own alterations. You're talented! I really like the look of the unfinished hem on those jeans. Great look! very pretty look and wonderful company! I'm loving your rings! They are so gorgeous. and what an amazing trench. 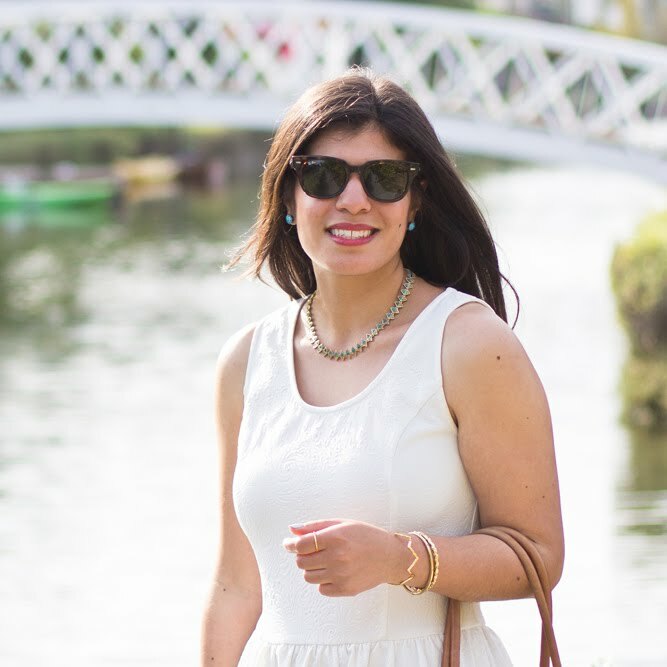 Love this neutral yet ultra chic and sophisticated look on you! The leopard print clutch is the icing on the cake! 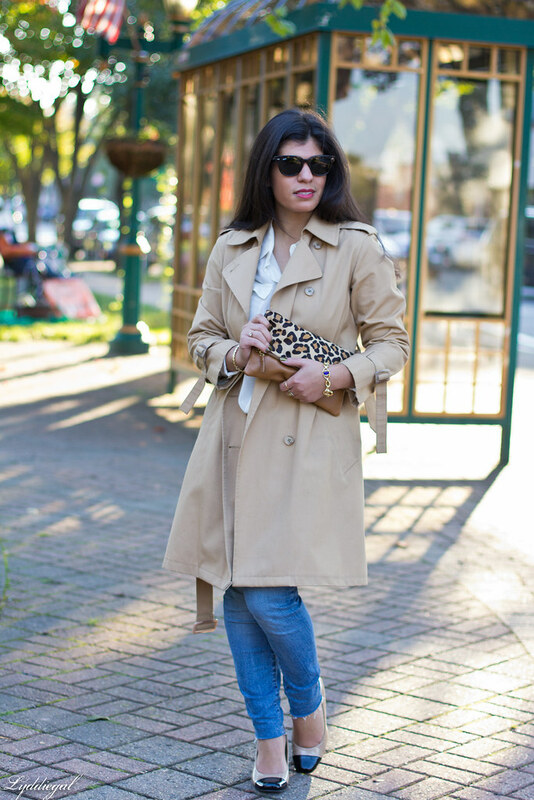 Loving your trench and your rings! 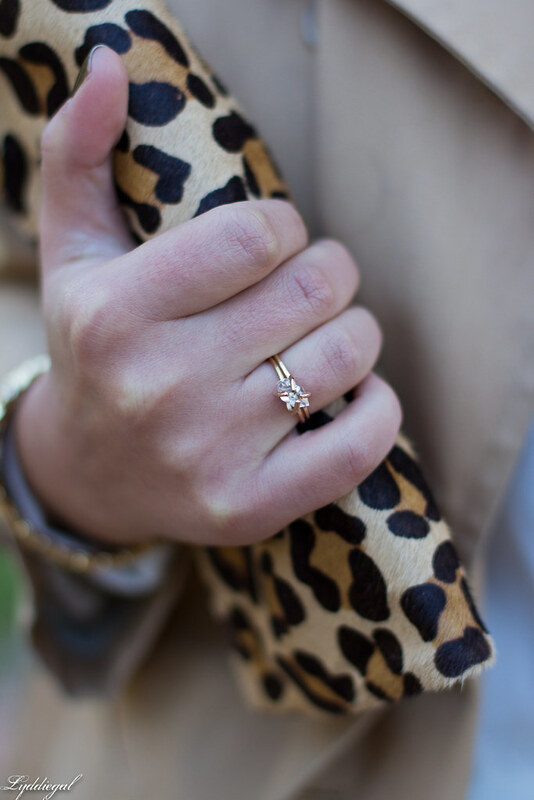 That ring is way too adorable and we're so in love with your clutch!! What a beautiful ring! Cocktail rings are fun sometimes, but I like understated ones that you can wear everyday like the one you chose. You can easily wear them with casual or dressy outfits! What a great giveaway with gorgeous pieces!! I love your blue pants, by the way :) You look so sophisticated! I might pick the clear dreams necklace!! Very nice accessory pieces! I love the leopard print clutch and those frayed end jeans! I like the gold herkimer diamond ring! Love that pop of leopard, Lyddie! And that trench is looking fierce. I'm glad to see that you're so eager to embrace the fall weather. It's still being iffy here, but don't you love how the light changes and becomes heavier? I love classic outfits like these that are just so timeless & chic! Thank you for joining TBT Fashion link up. Have a great weekend! I love the knot ring and the initial ring! You look fabulous! I have that lumo ring isn't is so pretty. Sooooo classy & chic!!! Why don't you share this great look at the Spotlight Weekly I am co-hosting this week with Elle & Jacqueline - it's too good to pass up!! Happy Halloween!! I love the Clear Dreams necklace!! I think I'd go with a stack of the gold bar bracelets. So pretty! I love the cluster silver studs!! I love the 14k SKINNY LOVE RINGS stack! I think I would get something like The Perfect Circle Ring. Thanks for the giveaway.